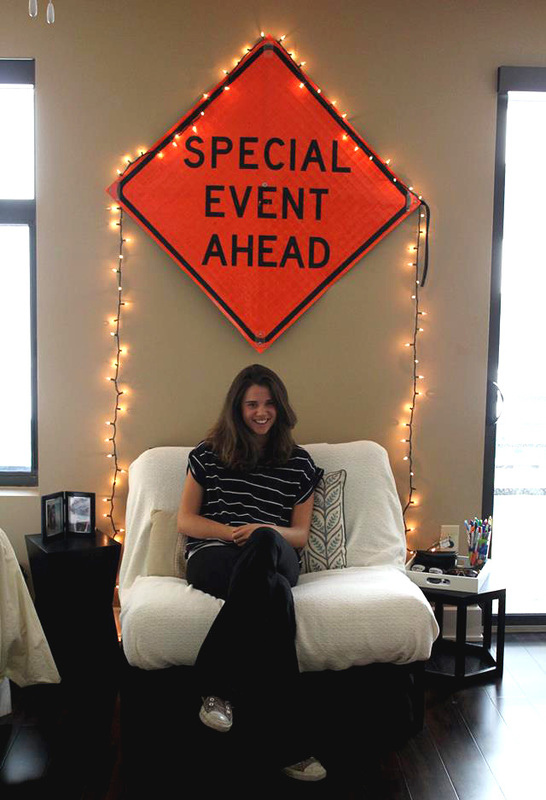 Upon walking into Laura Humphries’ and Kaley Piercey’s apartment, one instantly feels the creative atmosphere. It’s modern, bright, retro and as colorful as their lives are. “I’m a really artsy person, so that transferred over when I decorated,” biology major Piercey says, as she points to the Leonid Afremov recreated paintings hanging on their walls. Many people forgo the chance to style their home because of the misconception that interior design costs too much money. 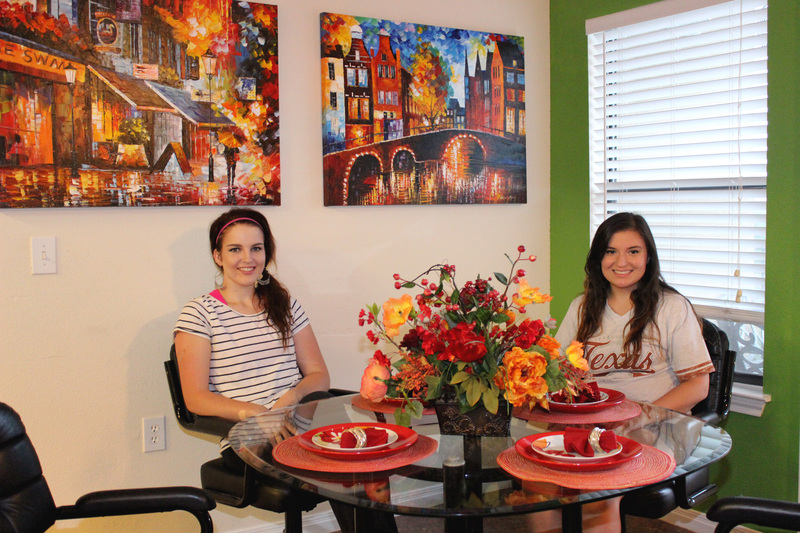 However, sophomores Kaley and Laura show that turning an apartment into a fun living space does not have to cost a fortune. “We don’t like to spend a lot of money. We like to find stuff that’s cute but also not really expensive. A lot of the things we have we got from Craigslist,” Humphries says. The roommates enjoy shopping at Ikea, Kohl’s and Ross when they’re in need of a little apartment revamping and are looking for a steal. Although many people envision their dream house as a thing of the future, Piercey and Humphries wanted to make that dream a reality now. “It was mostly me just moving into an apartment for the first time and wanting it to be cool and interesting,” Piercey says. 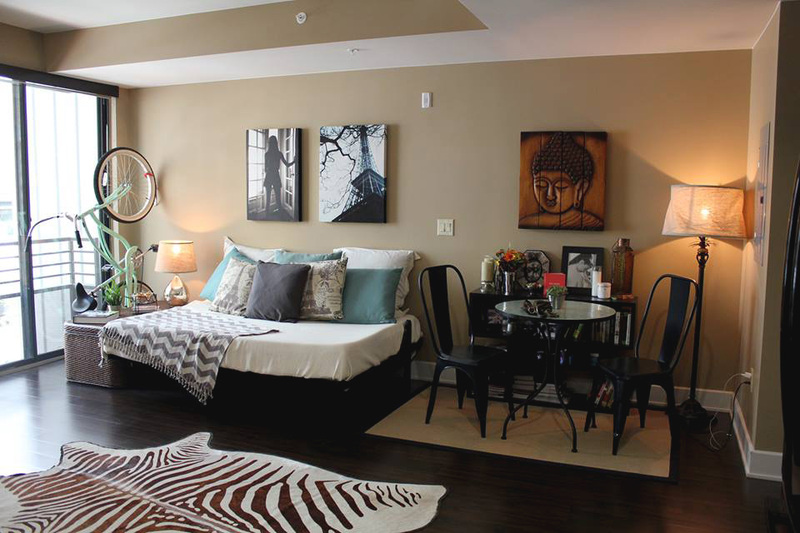 Humphries agrees and adds that they envisioned their apartment as a homey place — one without bare walls. As an English senior, Megan Alba is no stranger to creativity, especially when it comes to creating a different world behind her apartment door. “I’m here all the time. Being an English major I have to maintain a somewhat creative life style. So I wanted something that’s inspiring to be in," Alba says. One walk around Alba’s apartment and one sees that every trinket was selected and placed there for a reason. A vintage Spider Woman poster hangs on the wall, next to the dining room chairs reupholstered with old comic book graphics. Tiny action figures are scattered across her dresser along with a mint green typewriter. 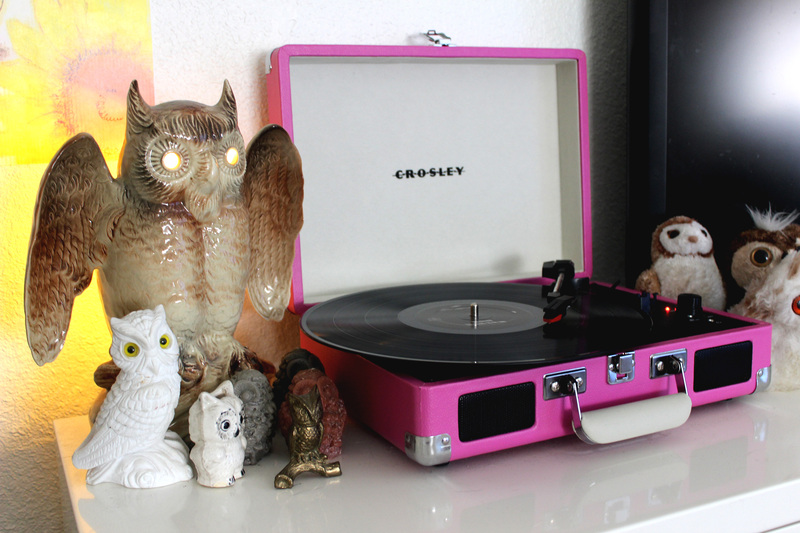 An adorable collection of owl figurines accompanies the bright pink Crosley record player resting on a glossy piece of furniture. 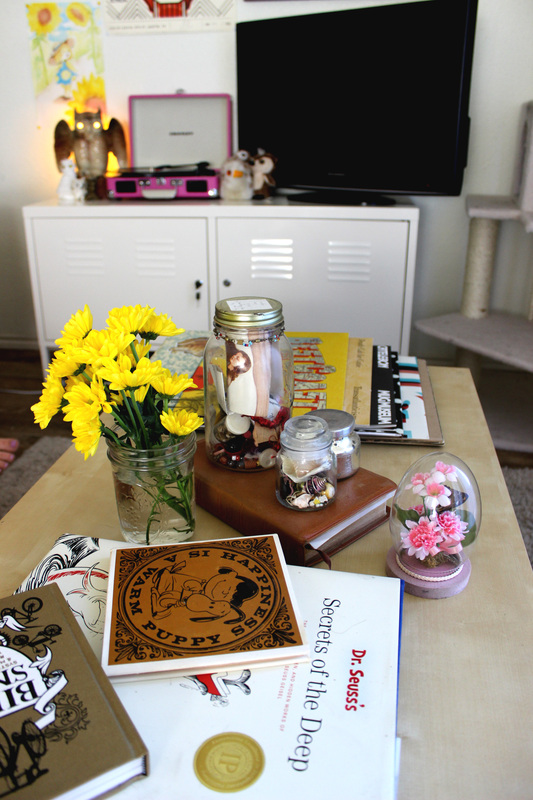 Alba’s simple $50 budget for apartment decorations contradicts the spunky, high-end, vintage feel of her apartment. 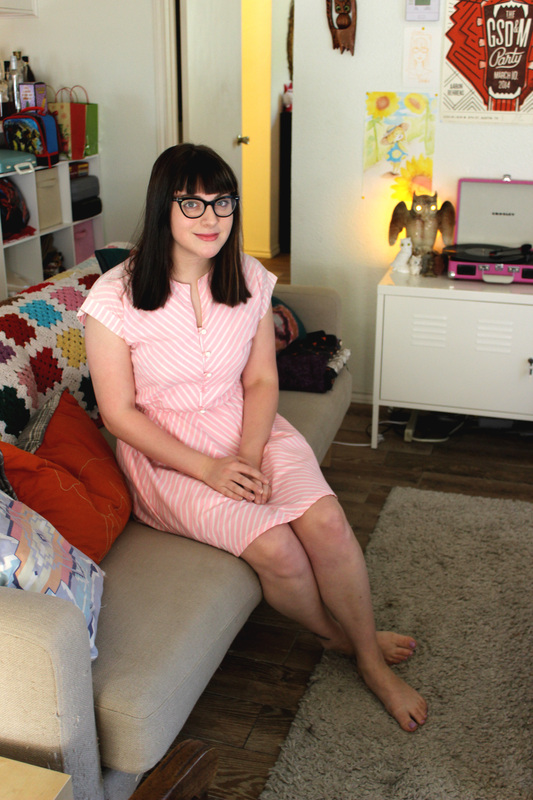 “I’d say the style of my apartment is Kitschy, kind of like tacky vintage. I really like colorful, unique things. My chair is from Goodwill, which I reupholstered. A lot of my pillows are handmade, along with my blankets,” Alba says. She says that she wanders into thrift shops thinking about the colors she already has in her apartment to add to the existing color scheme and aesthetic. In addition to to her many original works of art, Goodwill, thrift shops and Tumblr are Alba’s go-to sources for inspiration. 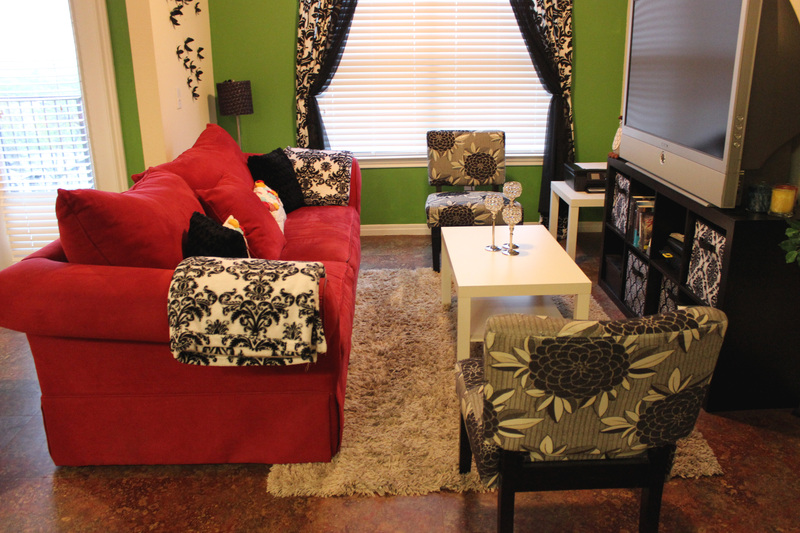 Journalism senior Madison Hamilton also raises the bar when it comes to the creation of a gorgeous living space. Hamilton’s bohemian studio-style apartment is a departure from her previous eight-person, shared apartment in Los Angeles, to say the least. “I loved it. It was really fun. But, after that, I thought, ‘I’m gonna live alone for a little while,’” Hamilton says with a laugh. Hamilton’s studio comprises many worldly influences. The light blues and greys show the remembrances of a sunny and serene California. Her wooden accent painting shows hints of East Asia. The photography and bicycle hanging firmly on her wall add a familiar Austin-esque, hustle-and-bustle feel to the place. And, with an eye-catching rug to spice up the studio floor, it’s no surprise that Hamilton is a fan of World Market. “I’m not a very black and white person. I like wearing colors,” Hamilton explains. She advises people to not be afraid of mixing patterns. She also suggests to pick a color and then decorate around that color. Hamilton’s risks certainly pay off: She finds a graceful balance between patterns and shades with accents. Many fear that money and time makes it impossible to create a living space that showcases who you are as an individual. However, reinventing your home away from home doesn’t have to be a chore. It may not transform overnight, but over time you’ll start finding decorative pieces that you love and have to place inside your sanctuary. Interior design not only lifts your spirits, but it also makes you feel at home. A happy and creative apartment has the power to inspire you to continue on in the release and expression of your personality within the walls of your apartment and in every facet of your daily life.